After the tragedy which saw former Leicester City owner Vichai Srivaddhanaprabha and four others die in a helicopter crash last month, the club’s fans have been paying tribute. 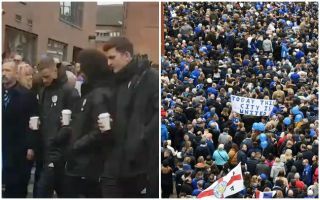 Thousands of supporters gathered in the city for a memorial walk on Saturday ahead of their game against Burnley, which will end at the King Power Stadium ahead of kick-off. It’s the first home game that the Foxes have played since the tragedy happened, and so it will undoubtedly be an emotional occasion for those in attendance and others watching on from around the world. As seen in the videos below, the likes of Andy King and Harry Maguire could be seen also taking part in the walk, while the turn out just shows the impact that Srivaddhanaprabha had not only on the football club but also the city to see so many people take part in the walk. There will undoubtedly be further tributes and opportunities for the Leicester fans and players to pay their respects on Saturday, but boss Claude Puel will also hope to see his side deliver the perfect tribute by dedicating three points to their late owner on what promises to be an emotional day for all concerned. Ahead of Leicester v Burnley, as many as 20,000 fans are walking to the King Power Stadium in tribute to Vichai Srivaddhanaprabha.